StreetView is great but it's so last year – as in the footage taken for it is nearly a year old. Google knows this and that is why the search giant has launched a new Webcams layer for its Maps service. Click on the Webcam option in Google Maps (if you can't see it, then just type 'webcam into the Maps' search bar) and a plethora of square boxes will appear on your map. If you select any one of these you will get a recent image from that particular webcam. In our short test, however, the Webcam option only looks to be available for maps in the US. According to TechCrunch, the layer gets its feeds from Webcams.travel, so they are constantly updated. 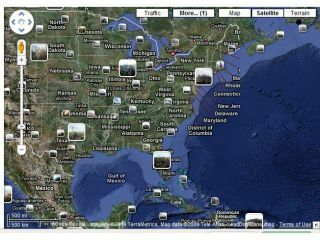 Instead of seeing moving footage, however, all you will get is a still image of the place you clicked on. The move by Google is a good one. StreetView recently launched in the UK and while it is a superb service for the curious among us, the images are out of date, with shops that have been a victim of the credit crunch, like Woolworths, still up and running. Once the Webcam service is rolled out to the UK, it will be a great way to check traffic and the like before setting off on your journey.